We're sorry, there are no drop-off locations in your area at this time. We suggest you check back closer to the year-end holidays (November/December) or to our Earth Week collection (March/April). Or please consider holding a toy collection in your area. If you have or can collect 50 or more gently used plastic toys, we will arrange for a drop-off at a local organization. Just go to collect toys to register. It's really easy and fun. We give you access to flyers, merchandise and other promotional items to promote your collection. So get started today! We're sorry, there are no drop-off locations in your area at this time. We suggest you check back closer to the year-end holidays (November/December) or consider holding a toy collection in your area. 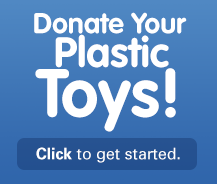 If you can collect at least 50 plastic toys, we will arrange to place them with an organization.